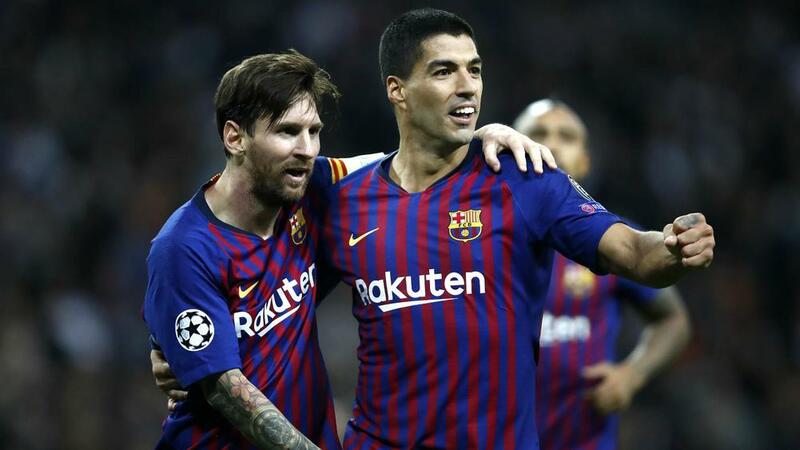 Gerard Pique described Lionel Messi and Luis Suarez as the world's best strike partnership following Barcelona's 5-0 thrashing of Levante on Sunday. Messi hit a hat-trick and assisted goals for Suarez and Pique as the champions restored their three-point advantage at the top of LaLiga. Barca's front two have now scored more between them than Real Madrid and Atletico Madrid in the top flight this season, while Messi is the only player in Europe's top five leagues to have reached double figures for goals and assists in 2018-19. And Pique thinks there is little else that needs to be said to describe his ruthless team-mates. "Twenty-eight, with me!" he joked to Spanish television when asked about Messi and Suarez netting a combined 25 goals in LaLiga. He then continued: "Luis and Leo are the best couple of forwards from the last few years. Luis has goals in his blood and we've already said everything about Leo. We have a lot of firepower up front." Barca's win means they need only a point against Celta Vigo to ensure they will finish 2018 at the top of the table. Pique, though, is frustrated the mid-season break is approaching given the form his side have found. "We've been in a very positive vein in the last few games and it's a shame that the Christmas break is coming, because we've found our cruising speed," he said. "In the last few days, we were playing better, conceding fewer and getting a lot of goals. It's very positive. We're better in defence and we're playing very good football."